The cart, with its hay shelvings, is ready to bring in the maximum amount of hay or straw at harvest time. At other times of the year it would carry sacks of grain, straw, a load of turnips for winter feeding, churns of water from the river if the farm house supply ran low in summer; in fact, anything heavy or bulky that needed to be moved more than a few yards. 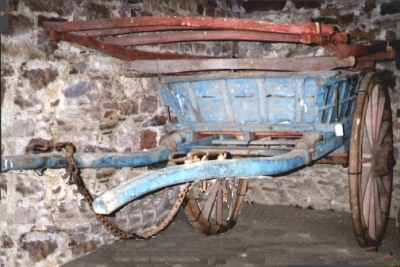 This cart is built for a big cob, such as a Dales or Clydesdale cross. The chain between the shafts goes over the ridge of the cart saddle to carry the weight of the shafts. Students (right) from Newton Rigg's Farm School, bringing home a Clydesdale and a farm cart at the close of a winter day in 1934. The horse is nearly as well clad as the boys, with a jute sack over his back. The shelvings are stored after haytime, until they are needed again. The "empty" square in the centre of the shelvings is the size of the normal cart loading area, about 4 feet square. You can see how much larger the shelvings are. The raised section at the front lifts the load high enough to clear the hindquarters of the horse. Using the shelvings, you could load more than twice the normal volume of light stuff, such as hay or straw, onto the cart. Hay could be stored either in the "sink mew" indoors in a bank barn, or built into stacks outdoors. Indoor storage was commoner in the Lake District to protect it from wet weather. Bank barns made use of the natural contour of the land to provide an inclined plane up which the loaded cart could be drawn by horse power. The hay was unloaded down into "mew" and, once that was full, onto the top floor of the barn. In winter cattle were kept indoors in the lower part of the barn, where the hay could easily be fed to them. The hay paddle was used to pack down the fluffy new hay into a solid mass. It could be cut in blocks to feed the cattle during the winter. Silage made in clamps today is cut out in a similar manner, but with mechanical tractor-mounted grabs. Silage was unknown in Cumbria until around the 1950s. David Trotter recalls a farm that he worked at, Moss End, near Farleton, making silage in 1950, but the two farms he worked on after that still only made hay. In many areas, the sled was the ancient, and preferred method of transporting feeding stuff and other bulky materials. Pringle reported in 1794 that the most commonly used carts "may be fifty two inches in length, thirty six in breadth and fourteen and a half in depth", capable of carrying less than "sixteen cubic feet" in volume. Two thirds of the cart's length was in front of the axle, which was made of wood.